Our dancer auxiliary group is called The Neighborhood Temple Priestess. Right now it’s in the first stages here in Seattle, but eventually there’s a dream of branching out all over the world. Our mission is to demonstrate to the greater community, the exceptional rewards belly dance has for women of all ages, sizes and backgrounds. To counter the stereotypic images that sometimes prevail by the unacquainted. The Neighborhood Temple Priestess Steering Committee helps with the studio organizing of events, and on-going studio support. They are an important component in keeping our doors open and continuing to bring an array of creative projects, classes, workshops, and performances your way. It is important to realize that we, as American women, are free to engage in physically expressive arts like ice skating, ballet, gymnastics, tango, hula and belly dance. 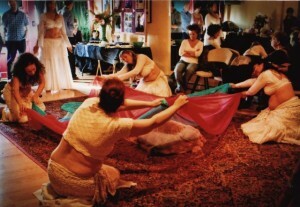 We have come to understand belly dance as a positive sisterhood that comes from ancient archetypal foundation. It is a deeply expressive art form that originates from things directly feminine; birth, belly, breasts, hips, expressive eyes and soft hands. It is soul candy rather than just fleshy sensual delight. The form serves us throughout all the stages of our lives; girls, maidens, mothers, career women, mature women and wise seniors. It builds self esteem by connecting women to their bodies, their rhythms and the environment that surrounds them. It gives them access to independent self expression and creativity. It keeps the body fit. At the same time it engages the mind through costuming and dance design and feeds the spirit by way of breath work, cathartic exertion, spinning, ritual and devoted practice. In this way, it is never boring. The Neighborhood Temple Priestesses are not about any “one” style of belly dance but support belly dance in all its artistic diversity. The priestesses act as facilitators in community to mentor other women and demonstrate the power behind this ancient dance. They do not wish to compete with professional performance venues but fill a charitable niche by hosting meaningful social occasions for women in need; baby showers, wedding showers, healing times, wakes, ground braking events. They strive to lend support to organizations like Code Pink Women for Peace, Battered Womens and Homeless Shelters, Senior Centers, and Childrens Hospitals. • The Neighborhood Temple Priestess periodically make beautiful hand crafted items on display and for SALE in the VDP Studio store. Proceeds benefit the studio and make it possible for VDP to offer programs like the Belly Dance Stimulus. Please take a look! • The NTP offers a very special session you can purchase called “Veil Therapy”. It’s an experiential mix of loving dance performance and personal stress release. Very hard to describe in print. It makes a great gift for family or friends and is a great way to support our work! The patron commissioning the session lays down on carpet and pillows and relaxes. Between 2-6 dancers do a dance of laying colorful veils over the person and slowly and gently puling them off in different orders. Sometimes as few as 4 or 5 and sometimes as many as 12-20 feather weight veils. The experience is gentle and soothing from the point of view of the recipient . It is visually other worldly and kaleidoscopic. It is beautiful to do the dance for folks, to witness as a by stander or be on the receiving end. Our studio provides the perfect atmosphere to experience a session. Great for kids, husbands and the elderly. The veils are light weight and do layer up over the body including the face. This does not seal off air or anything and there is no rational reason to freak out (we haven’t lost anyone yet). However if someone suffers from actual claustrophobia this may not be appropriate. We will be accepting donations of materials that can be used in product development and construction. Please feel free to call and ask us if we can use what you may have to offer.